Oyannews: The number of PKK terrorists killed in counter-terrorism operations in southeastern Turkey since Dec. 15 has shot up to 296, Turkish General Staff announced Tuesday. According to a statement on Turkish Armed Forces’ official website, the majority of the casualties took place in the town of Cizre in Sirnak province. 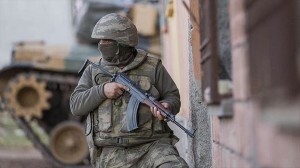 Out of the around 300 terrorists killed so far, 203 were in Cizre, while 33 others were killed in the nearby Silopi town, and another 60 killed in the central district of Sur in Diyarbakir province. The PKK – considered a terrorist organization by Turkey, the U.S., and the EU – resumed its 30-year armed campaign against the Turkish state in late July 2015 following the end of a fragile two-year peace. Since then, more than 200 security force members have been martyred. Last Thursday, President Recep Tayyip Erdogan said 3,100 PKK terrorists had been killed in Turkey and northern Iraq over the previous year.